Another presentation made by staff of the International Livestock Research Institute (ILRI) at the Asia Regional Livestock Policy Forum held in Bangkok last year (16–17 Aug 2012) (see previous posts on this News Blog about presentations made by ILRI director general Jimmy Smith and ILRI director Steve Staal) is one on ‘Human health risks at the animal-human interface’ by Joachim Otte, of the Food and Agriculture Organization of the United Nations (FAO), and ILRI veterinary epidemiologist Delia Grace. 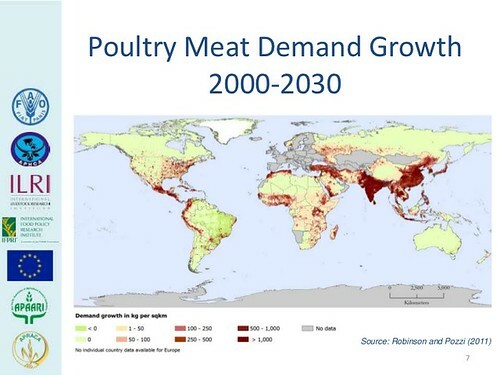 Their overview notes Asia’s growth in human populations and livestock food demands, the response from the livestock sector, the implications of those for infectious and parasitic disease dynamics and impacts, and the elements for a response. 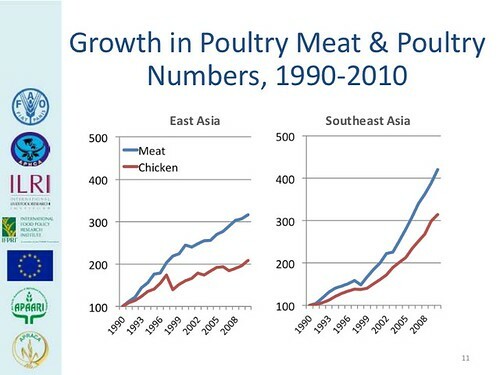 They first showed the skyrocketing growth of livestock products in Asia. 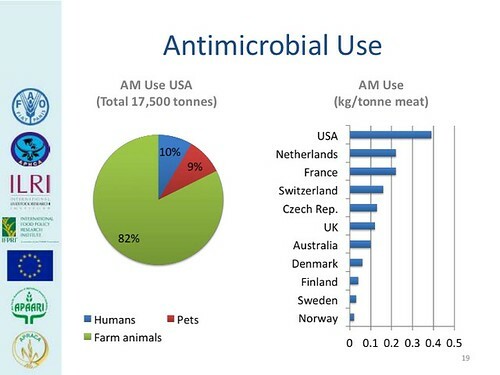 The presenters then outlined the use of antimicrobials and cost of antimicrobial resistance. 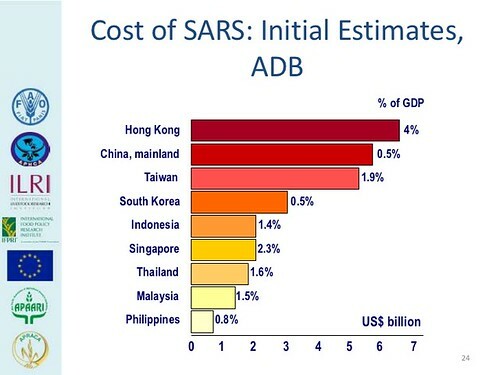 Otte and Grace provided the estimated huge cost of SARS alone. 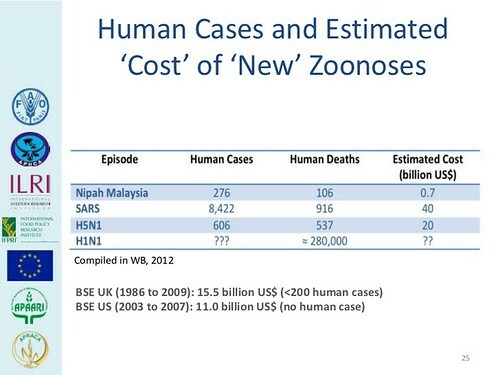 And they gave the estimated cost of newly emerging zoonoses (diseases shared by animals and people). View the full presentation: Human health risks at the animal-human interface, presented by Joachim Otte and Delia Grace at an Asia Regional Livestock Policy Forum held in Bangkok, 16–17 Aug 2012, and organized by ILRI, the United Nations Food and Agriculture Organization (FAO) and the Animal Production and Health Commission for Asia and the Pacific (APHCA). 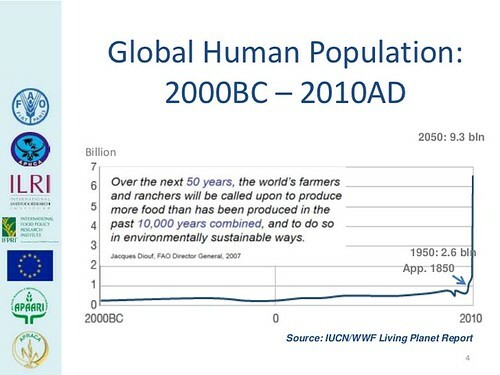 View a slide presentation at the same Bangkok Forum made by ILRI director general Jimmy Smith, Health at the livestock-policy interface, and/or watch this 25-minute filmed presentation of his presentation. 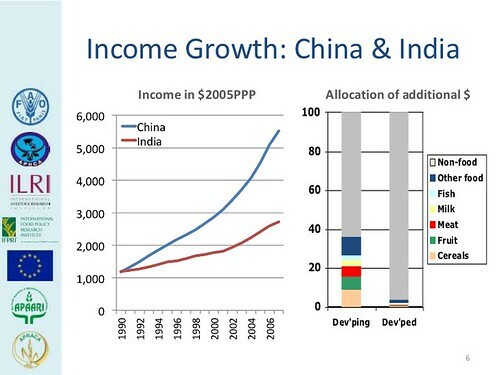 See another slide presentation made at the Bangkok Forum, Poverty, food security, livestock and smallholders, by ILRI’s Steve Staal and FAO’s Vinod Ahuja. 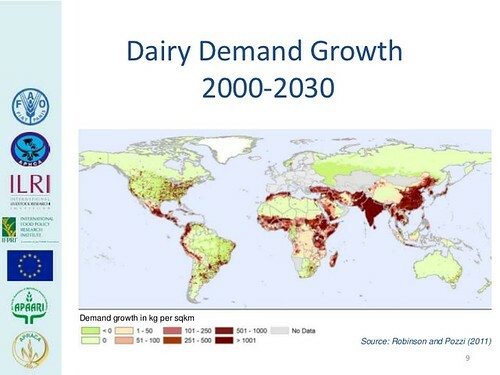 This entry was posted in Asia, CRP4, Disease Control, Emerging Diseases, Health (human), ILRI, MarketOpps, PA, Presentation, Spotlight, Zoonotic Diseases and tagged 2012AsiaLivestockPolicyForum, APHCA, Delia Grace, FAO, Joachim Otte by Susan MacMillan. Bookmark the permalink.